As mentioned previously, following the initiative of comedian Mark Thomas to demonstrate the dangerous absurdity of the Serious Organised Crime and Police Act 2005 (SOCPA), in particular of its Section 132, many had requested prior authorisation from the Police to hold lone demonstrations this past Saturday. Section 132 outlaws protests without police permission in a designated area within a 1 km straight line from the central part of Parliament Square. According to the Home Office, ‘during the period 1 August 2005 to December 2006 1,379 demonstrations have taken place [in the SOCPA zone] with an authorisation’. The aim was to have 2,000 mass lone demonstrations. The demo-ometer on Mark Thomas' website shows that 2,294 applications to demonstrate on Saturday 2007-04-21 were handed in. 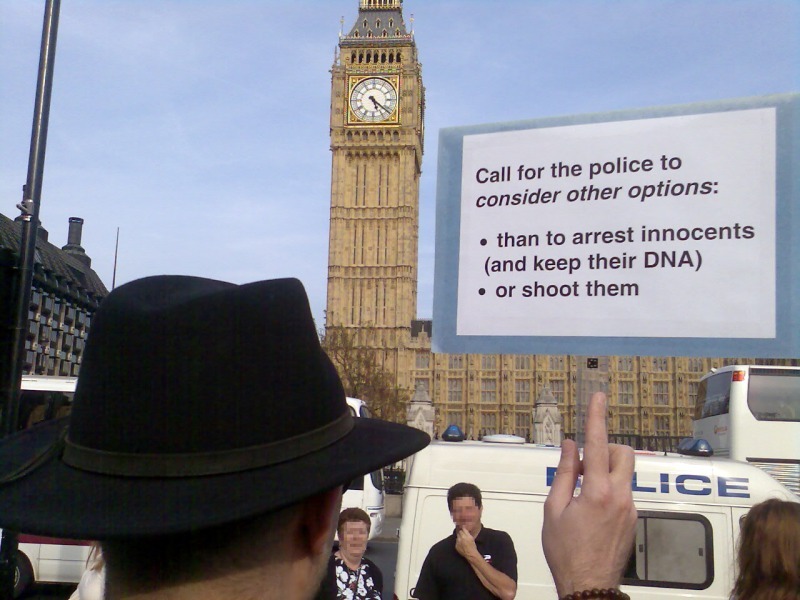 My own demonstrations was to ‘call for the police to consider other options than to arrest innocents (and keep their DNA) or to shoot them’. This is one of the issues I raised in my appeal to the outcome of the IPCC-supervised enquiry (I called the IPCC earlier in the week and apparently my appeal was to be reviewed the the IPCC legal team during the week). I demonstrated on the very same issue, a month ago.